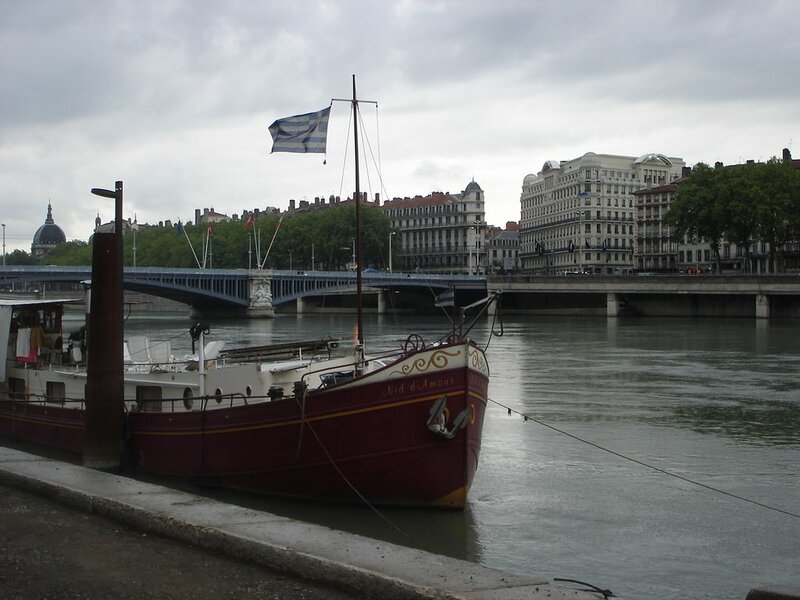 The quais of the Rhone are home to a number of these live-aboard barges, which vary greatly in size and shape. Some are more boatlike and probably capable of handling the open sea, while some are just big flat steel rectangles roofed over with a pilot house at one end. I saw one that had its flat roof planted with a lawn, complete with trees, rocks, a swingset, and a Weber grill. Note the bridge in the background--see how it has ornate 18th-century piers but a modern steel deck? When the Germans pulled out of town in a big hurry in 1945, they were careful to blow up every single damn bridge in town to stall the Allied advance. In some cases the piers were usable when the bridges were rebuilt; in others they just cleared the rubble and started from scratch. 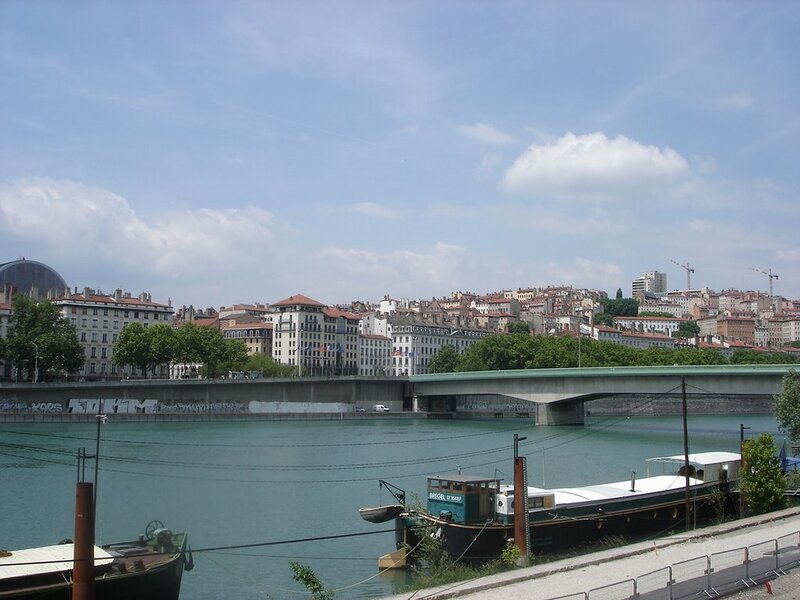 Lyon has some pretty ugly bridges (see second photo). 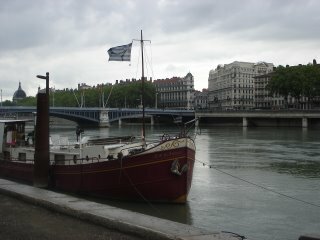 This one was taken on a different day from a few hundred yards forther north, looking toward the hill of Croix-Rousse. Croix-Rousse used to be the neighborhood of the silkworkers (canuts). The canut is to Lyon as the steelworker is to Pittsburgh: iconic, blue-collar symbol of the city and of an industry that no longer defines it. Croix-Rousse is a trendy place to live now, thanks to the conversion of many of the old maisons des canuts, which had nice high ceilings to accommodate silk looms. Arched building at left is the Opera. 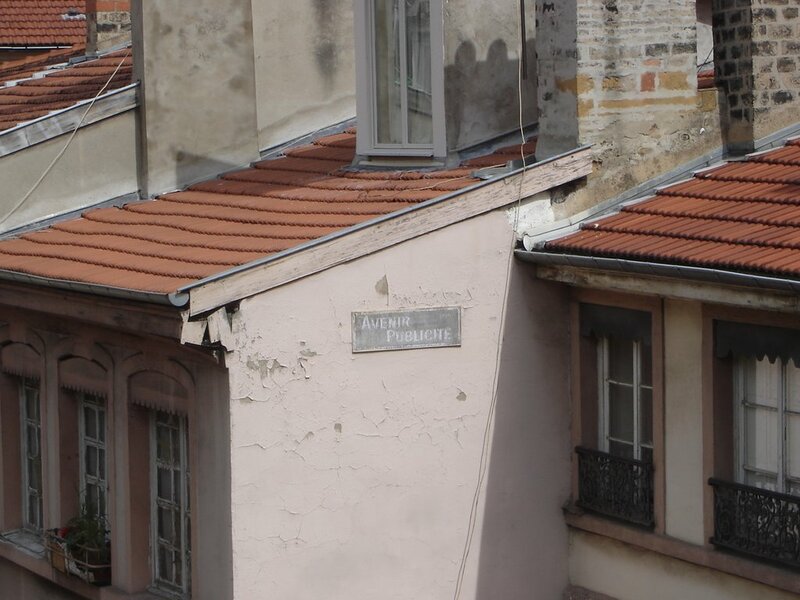 This is taken from the balcony outside Boog's room, overlooking the side street. You'll have to enlarge the photo to read the sign, but it reads "Avenir Publicite" ("Future advertisement"). By the looks of this sign, the future isn't coming anytime soon. Also worth noting: this sign is six stories up, and I had to use a moderate zoom to take this photo. Now that's ad placement! 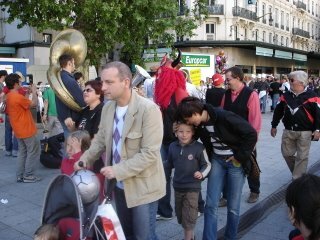 Typical Saturday afternoon on our street, the Rue de la Republique: There's a brass band playing for tips, a guy wearing a bright-red wig and Viking horns for no readily-apparent reason, somebody selling balloons, and three guys in chef's toques and aprons (middle right). More Saturday afternoon on La Re. I really don't take very many pictures of people, and here's why. Unlike other bloggers or people who are actual photographers, I haven't mastered the art of "may I take your picture" or of doing so discretely enough to capture everyday people doing everyday things without evincing what-the-hell-are-you-looking-at looks like the one this woman's giving me. In this case I was trying to get a shot of a guy wearing a long curly wig, tightie-whities, and construction boots, and carrying a guitar. (He's obscured by 4 different people at center right.) Without, you know, looking like I'm trying to take a picture of a guy in his underwear. 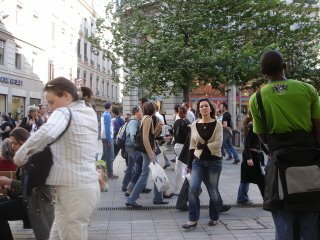 Looking at this photo, I realise I should have focused on the Linda Evangelista lookalike sitting on a bench at left.